See the 4 different feeding milestones baby should be reaching by 3 months old. Each milestone has a short clip so you can see the different feeding milestones for baby and compare to the movements of your baby. To see more milestones and videos for 0-3 month old babies visit our baby page. Pathways.org milestones video series helps parents and caregivers track their baby’s development and detect possible delays? The first 3 months of a baby’s life are a critical time for growth and development. Infants begin to learn how to move their bodies and interact with others. 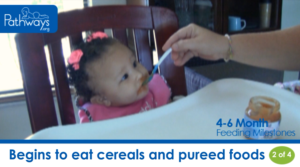 Visit our feeding page for info, tips, videos, and more feeding milestones. Use Pathways.org resources to track baby’s milestones and help identify potential early feeding difficulty. If you notice your baby is not meeting their 0-3 months feeding milestones, talk to their health care provider.